I can never answer the question, "What is your favorite perfume?" However, if someone asked me to name my favorite contemporary fragrance house, I'd probably name Frédéric Malle’s Editions de Parfums. After all, this company is responsible for two of my favorite perfumes, Lipstick Rose and Iris Poudre, as well as several others that I wear on a regular basis, including L'Eau d'Hiver, En Passant — and Lys Méditerranée. Lys Méditerranée is a "tribute" to the lily, designed to evoke "a scorching summer evening as the Mediterranean sea spray mingles with the spicy scent of ginger lilies." It was developed by perfumer Edouard Fléchier and was released in 2000; its notes include ginger lily, lily of the valley, angelica root, orange flower, water lily, salicylates, ambrette seeds, musk and vanilla. The Frédéric Malle website describes Lys Méditerranée as "radiant," and reviewers have often used the same adjective, for good reason. Many lily perfumes turn plasticky or soapy or overly sweet; Lys Méditerranée is a welcome exception. It opens with an intriguing introduction: a bitter orange-leaf note, a roughened green thread that leads the way the fragrance's creamy white lily center. The fragrance's second phase surrounds the lily with a complex salt-air accord. I'm not usually a fan of marine effects in perfume, but this one is sophisticated and realistic at the same time. It also seems to lift the floral notes off the skin on its "breeze." An hour or so into my wearing of Lys Méditerranée, the salt-spray accord, the waxy-cool lily heart, and the sharp green-leaf note blend seamlessly into something really beautiful. If I closed my eyes and you waved a blotter spritzed with Lys Méditerranée under my nose, I could easily believe that I was smelling an actual flower. As the day goes by, this lily seems to be transported from a garden setting into a simple-yet-elegant interior: although Lys Méditerranée never quite turns into a hothouse flower, its dry down is pure and polished, as though the flower had been trimmed and set in a vase. This fragrance has very good staying power: after eight hours, I can still detect a soft (but soft persistent) lily note on my skin. Nearly four years ago (! ), I included Frédéric Malle’s Lys Méditerranée in my list of favorite spring fragrances. I've recently realized that I enjoy this fragrance just as much, if not more, on a chilly winter day. Just like a gift of fresh flowers in January, it feels unexpected and rare, and it "blooms" beautifully in the cold air. Frédéric Malle Lys Méditerranée Eau de Parfum is available in 50 ($165) and 100 ($240) ml, or in a travel set (3 x 10 ml, $110). For buying information, see the listing for Frédéric Malle under Perfume Houses. Note: top image is Inside [cropped] by Micky** at flickr; some rights reserved. This is my favorite lily fragrance of all time. So well done, in my opinion, no others come close. And I’m the type of person who is usually hardpressed to pick favorites! Hi, Fragrantfoodie — Mine, too! I remember liking Yosh’s Stargazer, too — but this is the lily that called me back again and again. I think it does something really difficult in an effortless-looking way. I love this one too. Love the saltiness, which sets it apart from some of my other fave lily scents. Yes! That salt-air aspect is one of the things that makes this fragrance special. I hope you’ll own a Malle soon, too! Oh, interesting! I was going to ask how you would compare it to Serge Lutens Un Lys since that is also lily and vanilla, but saltiness would def make it different (it seems to me?) Would love to hear any other thoughts! Great review, very intrigued now! 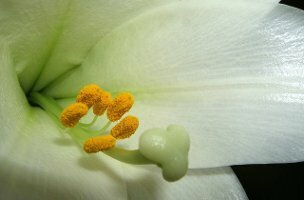 C.H., I don’t care much for Un Lys, or for most lily fragrances, come to think of it! They usually feel a bit “flat” to me. I think the saltiness of this lily is part of its attraction for me. Also,the lily note itself is just so pure and creamy and elegant, not at all like cheap soap! I like both Un Lys and Lys Mediterranee, but I think I’d rather own LM because of the salty “lift”. I loved this review so much that I put on some Lys Mediterranee right away. Like you, I find that it’s perfect on a chilly winter day. Perhaps, it’s because it reminds me of a summer day by the sea. Or perhaps, it’s so lovely that it’s beyond seasons. I’m glad you enjoyed it, V! This fragrance wasn’t love-at-first-sniff for me, since I’m generally not a white-floral person… but it has grown on me over the years, and now I can’t believe I used to reserve it for April/May! Lovely review Jessica. The salty accord has me intrigued. I can really see how this adds to its appeal. FM, Come to think of it, the first hour of this fragrance’s development could suit women *or* men, thanks to the salt and the green and the slight bitterness. Then it does turn more ladylike, of course! Worst scrubber EVER on me–if Barney’s sold saws I would have sawed my arm off. It made me nauseus within 5 minutes of application. Oh, no! I’m pretty sure that, no, Barneys does not sell saws. I really enjoyed your post. And I agree with you about some lilies being hard to take. But with Fredric Malle you have a house that knows how to really make some special perfumes. This one sounds wonderful. I don’t think this house has ever disappointed me. Even if one of its fragrances doesn’t suit my own taste or my own style (like Une Fleur de Cassie or Noir Epices), I can appreciate its craft and its appeal for others. This one is in my top 3! Oh, good! Always nice to meet another fan. Thank you, Jessica, for the lovely review. LM is a true beauty. My all time favourite lily is Un Lys but LM is a great contender. So glad you enjoyed it, LadyM! Happy New Year. Great review of a beautiful fragrance. That said, it’s one that I admire more than love — for whatever reason, lily notes just never feel right on me (with the lone exception of Decennial Lys du Desert). But like all FMs, LM is gorgeous stuff even if it doesn’t suit me personally. I feel the same way about gardenia — I love the actual flower, but I just don’t feel like “me” when I wear a strong gardenia note. And there are a few FM fragrances that I really respect and admire, and would recommend to others, but just don’t wear myself. What a beautiful review, Jessica! And it created a funny little coincidence: I was having a conversation with my boyfriend about Frederic Malle sample coffret (a conversation which, I hope, will come to a satisfactory conclusion by the end of this month when I have my birthday;)) and as soon as we finished, I opened NST and you had just posted your review. Needless to say, I am now looking forward to my birthday with even greater eagerness. l love white florals for winter and am really curious to try the Malles that are new to me, including Lys Mediterranee. I’ve been trying to pretend I didn’t know about that sample coffret since I heard about it last month. REALLY struggling to ignore it, and this review isn’t helping!!!! Oh, right. That coffret. I wish I’d never received the e-mail about it, hah…! It’s very tempting. thanks for your review, LM is one of my summer staples, and now you’ve convinced me to try it in the next days too! And: I missed out this sample coffret story, thanks for the tip, ladies! It is a dangerous item indeed and in my case, humming is not helping. I have started to measure everything in FM coffrets: a nice cashmere sweater on sale? But instead of buying two of these, I could almost get the coffret! And so on. I think it could be adopted as the official currency of Perfume Land: 1 FMC = 3 mitsoukos. I need to try my sample side by side with DK gold EDP. When I first tried it, I thought it lacked the oomph of Gold (though I don’t like heavy white florals in general). And I need to try DK Gold again! I usually like, or at least respect, the DK fragrances (except for most of the Delicious line). I do think Lys Mediterranee is delicate and complex at the same time — a deceptive simplicity! I’m so glad to see this review! I’ve always wondered if the reason this wasn’t reviewed was because no one at NST liked it. I loved this on first sniff. To me this is so pretty, warm summer air and lily cream. This would for sure be on my desert island list if I ever had to make such a list. “Warm summer air and lily cream,” yes! I was surprised when I realized that no one here had reviewed it yet. I don’t think it was a matter of group dislike, just oversight!! This smells like a flower greenhouse to me… Very nice! Great review. Thank you! and “greenhouse” is a good association for this one, too. This is one of my favorites, too – I love the dry down in it so much. I have a bottle with about 5 sprays left and I am rationing them but think I need to go sniff! The first Lys Mediterranee in my collection was a friend’s nearly-empty bottle that she passed along to me — when I finished it off, I realized I needed to order a decant. Should add that I enjoyed your review, Jessica. And agree, lily takes on a different, lovely character in the wintertime. For me, “white musk cold cream lily imposter” pretty much nails Baiser Vole. That one just really, really didn’t appeal to me! London must be an overwhelming place for fragrance-sniffing. I was last there in 1999, just before my fragrance obsession really set in, so I was able to enjoy the art and architecture and history and “regular” shopping without being distracted by perfume boutiques! I really like this and have one of the travel refills. I’m glad you reviewed it now, since January is the perfect time to get it out and spritz on a respite from the worst of winter! Yes, winter just got really bleak and chill here… so we need a few extra small comforts to deal with it! Thanks for a lovely review Jessica :). I adore this fragrance and it is prob my favorite lily (don’t tell Un Lys- I tell her that she is my favorite too!). One of the best things about this fragrance to me is that I consciously know that I shouldn’t love it! Aquatic lily! But it is gorgeous- perfection! I wear it on warm days, but I will take it for a winter spin and see! So true — the description “aquatic lily” wouldn’t appeal to me, but I gave this one a try because I trust the Malle line, and here we are! Haven’t smelled this one. I’ve smelled several from Malle though. He has a few good ones! I don’t like all I have tried but I do like some! It’s an extensive line, although they don’t flood it with new releases — and there are so many good ones!! Forgot, one house to try is Ramon Monegal, good stuff! He does a good iris, I am not huge into iris but it’s a nice one. Also, Ambra Di Luna, my fave of the year!! Lipstick Rose by Malle is nice, if one is looking for a louder scent then Drole de Rose, which is also a love!!!! I love Drole de Rose as a cute-and-easy rose-violet combination, and Lipstick Rose for dressier moments. I still haven’t tried Ramon Monegal, somehow!! That does sound like a great day! I like Musc Ravageur, too. I haven’t worn it in a while, though… must find my sample! I love fragrances with water lily, green notes, and a salt accord, hence my taste runs towards the men’s marines and aquatics. I had high hopes for Lys Medditerranee but was disappointed because it smells nothing like my beloved watery fragrance category. LM is way too strong, lasts almost forever, and reminds me of how Dune never lived up to its name for me either. From the comments here, I have gleaned that it is the white flowers in it that I cannot stand. Having voiced my opinion, I still have to add that it is a great perfume and very well done, it’s just not for me. Can you recommend a few other aquatic white florals, just in case anyone else has this preference? Now I’m curious! I used to like Creative Universe’s Mare, but it’s discontinued now. And I think Antonia’s Flowers has something in that category… Sogni del Mare? Whenever an EDP comes out with an EDT flanker in a frosty bottle, chances are I will like it! Thanks for this wonderful review. It’s one of the few Malles I haven’t yet tried. Lily is not always my best friend in fragrance but I do love DK Gold. I need to get a sample of this one. Do give it a try, Austenfan! I’m really not a big lily-wearer, but this one suits my tastes. “Radiant” is a good word… I remember I got this somewhere in 2005 when I visited the Malle boutique in Paris. The first time I sniffed, I knew I *must* buy it for my Mother. When I gave it to her she said, “This is the kind of scent that would raise the dead” and I fully understood what she meant… it’s just so full of life and joy!